Palm's best yet, WaveMapper 2 is immensely powerful, hugely enjoyable to use and truly unique. Creative Sound Map system. Sounds excellent. Cool Map Record option. Good preset library. Raw sample import and conversion. Powerful Wave Map engine. 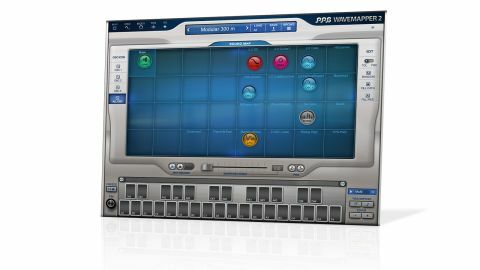 PPG founder Wolfgang Palm's current roster of synths - WaveGenerator and WaveMapper - started life as iOS apps, but made the transition to Mac and PC with the release of WaveGenerator last year. WaveMapper 2 (VST/ AU) takes the same route, bringing version 2 of the original iOS WaveMapper app to Mac and PC, and enhancing certain aspects of it. WaveMapper 2 is a wavetable synth that bears a number of similarities to its sibling, WaveGenerator, including the core architecture of three oscillators, three noise generators, four LFOs, a 24dB/octave low-pass filter, the Arptor step sequencer, a dual-output amplifier, selective preset element loading, and 13 envelopes for control of pitch, waveform, filter, noise, gain, panning and ring modulation. "Dragging an Icon onto any of the 32 fields in the grid loads the parameters associated with it"
However, while WaveGenerator's focus is on the creation and editing of waves within its 256- wave wavetable, WaveMapper's remit is more fun, its two main features being the Sound Map and Wave Map. The Sound Map is a 32-field grid that holds up to 31 user-selectable presets and a 'Base' preset (serving as the default, recalling the original Icon positions for the preset). The fields interact with eight Icons, representing the instrument parameter modules: Oscillator Sound 1, 2 and 3, LFO, Filter, Noise, Gain and Oscillator Parameters. Dragging an Icon onto any of the 32 fields in the grid loads the parameters associated with it (Oscillator 1 Sound, for example, comprising the Wave Map and Octave parameters) from that field's loaded preset. It's a brilliant approach that encourages experimentation with unusual parameter combinations. The Wave Map gives far more detailed access to the Oscillator source waves, and in v2 has been expanded to one Wave Map per oscillator. Each Wave Map can include up to 16 audio 'resources', which can be wavetables, Time Corrected Samples (TCS) or regular samples, sourced from the included library or created in the Analyser page. Wave Map allows you to define the playback Path through one or more of these audio resources, with the wave envelope controlling not only attack and release, but also playback direction. The Wave Map is WaveMapper 2's engine room, but it's the Sound Map that gets the creative juices flowing. There are various ways to populate the grid, including filling it with specific resource types (wavetables or Time Corrected Samples) or certain preset categories (basses, leads, pads and so on). You can also randomise the contents of the fields and the icon positions. The Map Record option is a real winner, recording each icon movement to a separate new program and creating a Bank of programs (MapRecord) that can then be morphed between. WaveMapper 2 includes an extensive library of categorised presets, and selective preset element loading enables very specific changes to made to them with ease. Stylistically, there are your typical evolving wavetable textures in abundance, but also some solid basses, cool arps and numerous effects - and, most importantly, the whole thing sounds stunning. If we have one gripe, it's just that the preset management system feels overly complex, but that's a very minor criticism of what is otherwise an unquestionably superb synth.